The best thing about a simple beading technique is it’s adaptability. Take a basic stitch and add different colors, shapes, and patterns, and you have a unique design all your own. It’s the simple techniques that we reach for again and again, because we know they can get the job done. One of my favorite stitches is the double spiral. Although it’s easy to do, and looks fantastic, double spiral isn’t as common as some other rope stitches like tubular herringbone. Because it uses up a lot of beads, it can be a great way to finish off mixtures or use up that collection of spilled beads you’ll never get around to sorting. The steps are almost identical to traditional spiral rope, with one extra row chasing the other. Because there are so many thread passes, it’s important to use large seed beads for the core - size 8/o or larger. It’s also best to use a sturdy needle. Though a small needle makes a better fit when plenty of thread is used, the limited space between the core and spirals requires a lot of angled stitches. The spiral rows can be made up of just about anything, though average sized beads (from 10/o to 12/o) are best at the ends, so that the rows fit together snugly. Just like a basic spiral rope, you can increase or decrease the length of the rows, add accents, or create patterns for different looks. 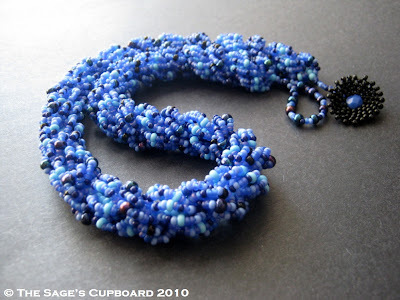 On a comfortable length of beading thread, pick up 4 core beads and 7 Color A beads. Slide them down until you have about an 8 inch tail, and stitch back up through the core beads. Pull tight to form a pair of side-by-side stacks. Pick up 1 core bead and 7 Color B beads. Stitch up through the first 4 core beads again, and pull snug until the new row slides into place. Stitch up through the new core bead and pull tight. Hold the beadwork so that the Color A row is to the left. Pick up 7 Color A beads, and stitch up through the top 4 core beads. Pull the thread snug, and push the new row to the left, up against the first. Flip the beadwork so that the Color B row is to the left. Pick up 1 core bead, and 7 Color B beads. Stitch up through the top 4 core beads and pull tight. Stitch up through the new core beads. Push the new row to the left. Flip the beadwork to begin the next row of A. These are the basic steps for creating the spiral. Continue adding new rows, flipping the beadwork between stitches. Often with really simple techniques, once the steps become too familiar, we can loose track of them. If you can’t remember which row was just added, check the top core bead. If there are 2 bead stacks exiting from the top of the core, it’s time to add a new core bead and a row of B. If there’s just one stack, it’s time to add a row of A. You don’t need to use completely different colors for the two spirals, but it is a good idea to make each one a bit unique. When stitching my Flutterby necklace, I used a single bead soup, but picked a contrasting accent bead for either row - pale blue on one side, and dark blue on the other. This helps keep track of which row is which, and makes stitching more intuitive. Lovely piece and a great tutorial. Thanks so much for this tutorial. I'm in love with the spiral rope made of seed beads... now this looks like double the fun! :) Can't wait to try it! Thanks so much for sharing it! Thank you! It's not a technique that you see used very often, but it's SO much fun to do. The spirals are so slinky and pretty. It's my all-time favorite bead soup stitch. Thanks for this Mortira, I've always wondered how this is done! Mortira, love this stitch so much (and all of the wonderful tutorials you share) and wanted to spread the love. I just posted about your tutorials and linked back from my blog! Thanks for all you share! I would love to know how you make the flower at the end. Do you have a tutorial on making it? Hi! Thanks so much for sharing this stitch! I really like it so far! Do you have tips on how to add on new thread? Thanks for any advice! Thanks, Megan! I'm glad you like it. To answer your question, spiral rope is one of the only stitches where I weave in old threads before beginning a new one. After adding a new spiral row, pull snug, and weave back into the row just added, and then through the core. Continue weaving in and out of the spiral rows until you're ready to trim (tying knots if desired). To add a new thread, I simply add a stop bead, then weave through the top 4 core beads and continue stitching normally. Why can't you have patterns in pdf so people live so far out of signal range can keep the instructions, otherwise your website is useless! Hi Marilyn, and thank you for your question! Readers are always welcome to copy and print tutorials for their own use; however, because this is a blog and not a repository, and all content is free, I generally don't have extra time to create a separate PDF for each technique featured. In the past, I have created PDF versions of tutorials upon request. It is very generous of you to share these tutorials. I appreciate them and all your effort.